Close-up photographs of insects illustrate key field marks. The text enables anyone to identify most insects observed in natural areas and yards to insect order. This booklet is a great resource for homeschoolers or parents promoting outdoor activities. Adults who enjoy outdoor activities such as hiking and birding can enhance their experiences by insect watching. Orders included are: mayflies, dragonflies and damselflies, walkingsticks, mantids, grasshoppers, termites, roaches, earwigs, cicadas and hoppers, true bugs, antlions and lacewings, dobsonflies, beetles, scorpionflies, flies, butterflies and moths, bees, ants and wasps. 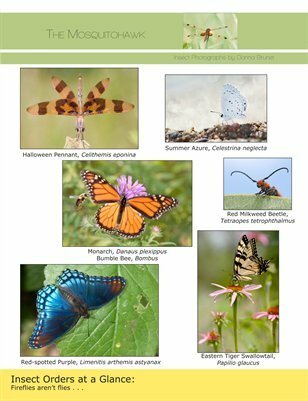 Additional field guides for each order will be published soon; those will provide identification characteristics to identify insects to family.